My repurchase of this was a gamble during a NoMoreDirtyLooks Friday deal. I had just sampled the Studio78 Chameleon foundation from NuboNau, loved the color-changing properties, but was desperate for a way to help the finish look less dry. Tanya, the aesthetician at NuboNau, recommended the Macadamia and Rose Moisturizer as a remedy for my dry cheeks along with gentle exfoliants, but hesitant to return to cream moisturizers and afraid of over-moisturizing my skin, I went back to the Geranium & Thistle Moisturizer, which is meant for my other skin concern: blemishes. The best part? No breakouts. Guess it was that cleanser after all. The ingredient list is really fantastic. As far as the moisturizer’s namesake, geranium has a has a cooling and calming effect on the skin while thistle is packed with skin-friendly omega 6 and is excellent at clearing congested skin and reducing large pores. I was pleasantly surprised to see manuka oil on the list, which is famed to be 33 times stronger than tea tree oil in killing certain strains of bacteria. Moisture comes from human-skin-friendly jojoba oil and borage oil, which plays an important role restoring the intracellular moisture barrier of adult skin as evidenced from experimental studies. tl;dr Cream initially feels rich, but dries to matte finish. Maybe too matte for me and the winter, but no breakouts thanks to killer ingredients. 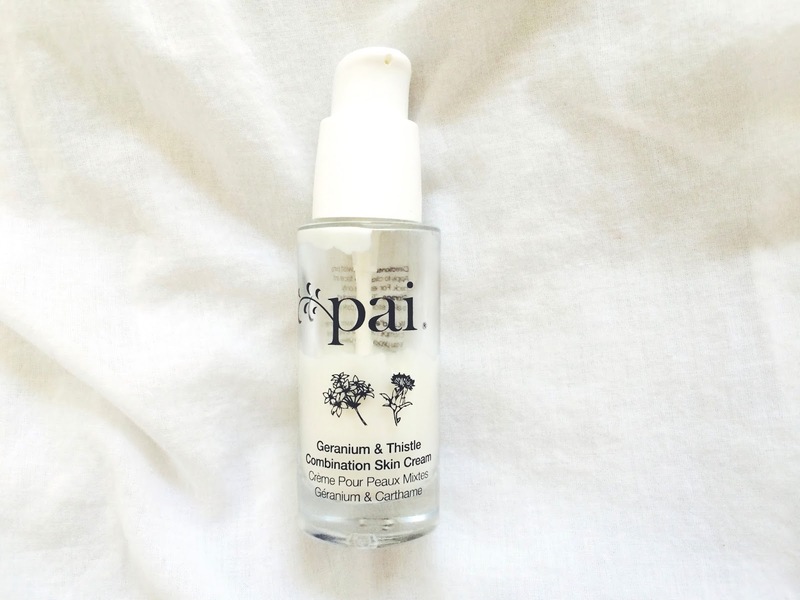 Have you tried any of Pai’s moisturizers? What are your thoughts? If not, what moisturizers have been saving you this winter? Thanks so much for this review. I have been on the fence about this moisturizer. I got a generous sample of the chamomile and rosehip one a couple of month back and while it gives me the much needed moisture during this winter season I have similar concerns with layering over one of my beloved facial oils. I just never thought it absorbed that well and then layering SPF on top kind of made me feel like I was layering too much. I may just have to give this one a try. I do have the Pai Rosehip oil, which I use 3 times a week at night and at times I feel it does not quite give enough moisture. Hopefully this one will solve this problem. Thanks for this nice review. I tried a couple of times some Pai samples…I wasn't too sure the smell and the matte finish . I mix this with the EDOLO Vitamin C Serum as well! I think they make a great combo! Great review! 🙂 This is one of my favorite moisturizers too! I love it for all the same reasons you mentioned. Sometimes when I'm feeling extra dry I like to mix in some of my Pai Rosehip oil, it's a great combo for my face.I think this is the only daily moisturizer I ever want to use! 🙂 I'm so curious about the Studio78 Chameleon foundation, definitely want to try that! No problem! That's too bad you didn't like the smell and finish–I myself like the smell, but I agree with you on the finish. Hi Lara! I love the idea behind Pai, but similarly, they are not my holy grail of moisturizers and I will continue to try other brands. I have been eying Kahina's products for a long time! I would love to hear how your skin likes Kahina's lotion.